Hi Andy! Thank you for agreeing to this interview. What did you do this weekend? How is your collection of jumpers ;)? It's still growing, more slowly though because firstly I have too many already and I'm running out of space, and secondly because my style of jumpers became hip and the prices have become insane. Your new album Cro Magnox is a little different from what you did before. In my opinion it's very melodic and a bit naive. What the reasons for the change in sound? I guess I wanted to challenge myself to make a vaguely serious album and see how it came out. I have been making fun tracks at the same time too which I will release soon, but I think it made more sense to put all these tracks together to try and create a coherent theme rather than a sort of compilation of ideas. Which is difficult for me because every time I make a track I want to make something different. I think the main thing in music which motivates me to want to make it is to create melodies that I like, so all the tracks here are attempts at that. Tell us more about the album. Does it contain any idea, what’s your inspire and why it is called that Cro Magnox? For me a lot of the tracks on the album had this bleak lonely vibe, and it reminded me of pylons and nuclear plants and industrial wastelands and this kind of stuff. 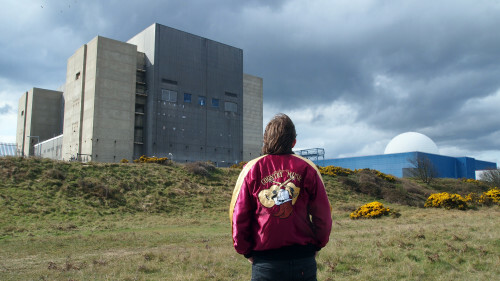 So Cro Magnon (which is the name for those french prehistoric humans) and Magnox (which is a type of nuclear reactor) is a play on words which means something like «Nuclear Human». What gears and setup you used when writing Cro Magnox? What is your favorite piece of hardware? And how many computer involved in recording process. It has to be the TB-303. Even to this day it's still a mysterious piece of hardware. I know that it's been recreated almost perfectly now with XoX boxes and stuff, but it's the fact that it was made like that seemingly by accident and that it created such a revolution in dance music. I love it because you can be doing a normalish track and you bring the 303 in and it just adds this alien factor which is almost random. I used the computer for recording and some mastering, I try to do as much as I can without the computer, but it's useful to have multitrack stems coz I'm terrible with levelling when I'm recording. I'll get too emotionally involved with a snare and it'll end up insanely loud, or conversely I'll subconsciously shun it and it'll end up inaudible haha. Cro Magnox was released only on vinyl and digital, as I understand CD format is dead for you? Personally I've never bought CDs so I don't really mind, but it was the label's choice and they are mainly interested in vinyl. CDs aren't dead for me in that if people want to buy them I would make them, but for instance I still have tons of my Live album CDs left, whereas my 7inch of Mediterranean Acid/Capsule in Space has almost sold out. That might just be down to the popularity of the release of course, but vinyl seems to have more of a cult/collector appeal these days. I like your style, you are so cute and funny. Mediterranean Acid video made me laugh to tears. How did you come up to this? Haha thanks. The track came from a genuine interest in music from the Mediterranean (from south Europe/Greece/Turkey/Syria etc and so on) etc that I managed to translate onto the TB-303. The video came later, initially I just wanted to make a quick edit of some old tourist board vhs tapes for a quick clip on youtube, but as I was watching them they were making me laugh loads so I decided to add myself and some old computer graphics and make it into something errr amazing. Tell us little more about your videos. Who creates it or/and help to make? I do them mostly by myself, I get friends or family or anyone to help if I need them to film me. I have no idea what I'm doing but it's a lot of fun to make them. Who would you noted among other acid producers? All the original Chicago masters of course, DJ Pierre, Armando, etc early 808 State/Gerald, early 90s techno/early Richie Hawtin, Aphex, my brother, Luke Vibert, UR (Mills/Banks), Global Goon, the list will never end though these are just the first people that came to my head. The most acid record has to be: Jaquarius — Love is Happiness for me though. Epitomizes the oddness of the 303 feeling. What would you be top of a Ceephax career for you? My main goal is to make a (good) film with my music as a soundtrack, or my own cartoon book or film animated...with my music as the soundtrack. Haha. Thanks for your time, Andy, we are waiting for new releases from you. Отличная работа! Только альбом вышел, и бац, интервью! Рецензию будешь писать?